The United States Congress designated the Sarvis Creek Wilderness (map) in 1993 and it now has a total of 44,345 acres. All of this wilderness is located in Colorado and is managed by the Forest Service. Old-timers sometimes pronounced "sarvis" as "service," and the Sarvis Timber Company once logged near here, lending its name to this Wilderness. Opening occasionally at islands of rock or in meadows of wet mushy ground, the Sarvis Creek Wilderness is foremost an unusually thick forest of lodgepole pine at lower elevations and Engelmann spruce-subalpine fir higher up. 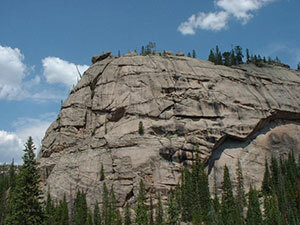 Unlike most Colorado Wilderness areas, Sarvis contains no alpine tundra. Sarvis Creek and Silver Creek, the two primary drainages, run westerly through the dense forestland, past small gravel bars and under many dead trees lying across the water, emptying into the Yampa River. At times virtually impenetrable, the tree cover provides homes for large mammals: black bears, mountain lions, elk, and deer. Over 20 miles of trails follow both of the creeks: 12 miles along the Sarvis Creek Trail, and 11 miles along the Silver Creek Trail. This area was hit hard by a mountain pine beetle epidemic in recent years. Falling trees can pose a great safety risk to campers and hikers. Planning to Visit the Sarvis Creek Wilderness? How to follow the seven standard Leave No Trace principles differs in different parts of the country (desert vs. Rocky Mountains). Click on any of the principles listed below to learn more about how they apply in the Sarvis Creek Wilderness.